Trained in the United States and Switzerland, our staff is well versed in the repair, service, testing and overhauling of Rolex watches. It is not unusual for even the finest Swiss watch, like a Rolex, to need an overhaul every 3 to 5 years. 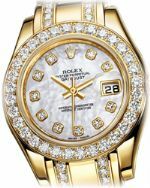 If you are the proud owner of a Rolex watch that is in need of repair, visit our Repair Forms page and we will provide you with a prompt estimate of your cost to restore your prized watch to proper working condition. You invested in a Rolex because of its high quality. Swiss Service can help you to retain its value. I never knew there were still Swiss-trained watchmakers until my Rolex broke. I was amazed by the quality and service of the Swiss Service Center.